The X-Prize Foundation has released its full-dome planetarium show, Back To the Moon for Good, as an online video. 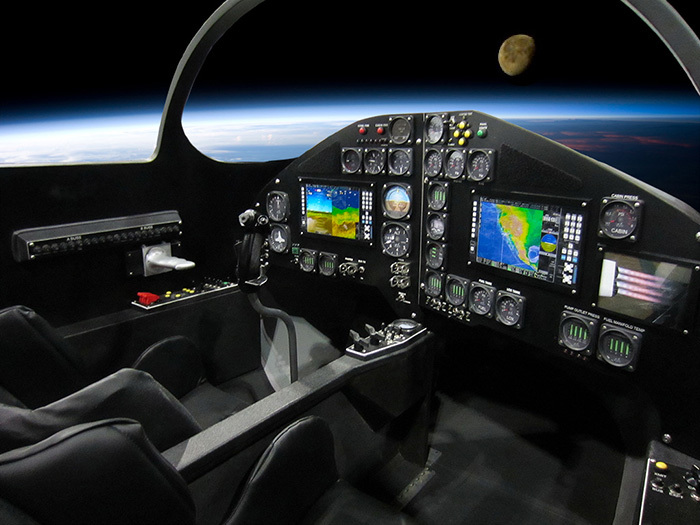 This artist’s conception shows the Moon as it might appear from the cockpit of the XCOR Lynx spacecraft. This is a sight that can only be seen from space: The Moon against a black sky, with the Earth in daylight. 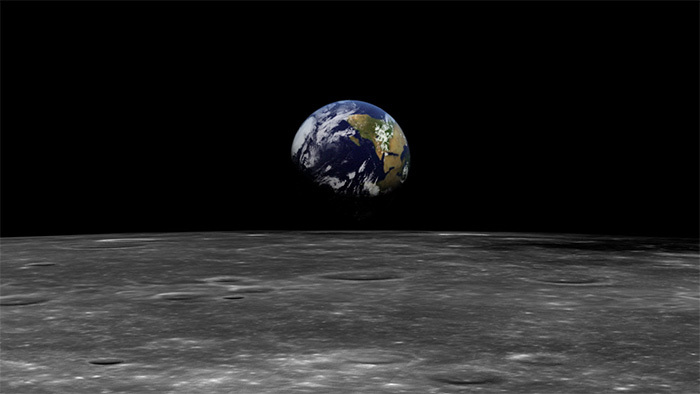 Fewer than .00001% of the world’s population have had the opportunity to see this sight. That number will increase dramatically in the next few years, when suborbital spaceflight becomes commercially available. At first glance, the Moon appears oddly dark. We usually think of the Moon as being quite bright, almost a pure white. That’s because we’re used to viewing it at night when our eyes are dark adapted. In reality, the surface of the Moon is fairly dark, as shown by observations and photos taken by the Apollo astronauts and the samples they brought back. Seen from space, with the sunlit Earth as a reference, the Moon shows its true color. For a more complete explanation of the Moon’s appearance from space, read this article. The Google Lunar X-Prize has announced new Milestone Prizes, which will provide technological stepping stones (and near-term financial help) for teams that are competing for the $30 million grand prize. Five teams have been selected to compete as finalists for the Milestone Prizes, which have a total purse of $6 million to be awarded this year. Winning the $30-million Google Lunar X-Prize requires landing a probe on the surface of the Moon, moving at least 500 meters on the surface, and sending back specified data. Teams have been struggling to come up with funding for the competition, though. As a result, the X-Prize Foundation has been tweaking the rules to help competitors along. The $1,000,0000 Landing System Milestone Prize for demonstration of hardware and software that would enable a soft-landing on the moon. Astrobotic, Moon Express, and Team Indus will compete. The $500,000 Mobility Subsystem Milestone Prize for development of a mobility system that allows a craft to move 500 meters after landing. Astrobotic, Moon Express, Hakuto, and Part-Time Scientists will compete. The $250,000 Imaging Subsystem Milestone Prize for a system to transmit high-quality images and video from the lunar surface. Astrobotic, Moon Express, Part-Time Scientists, and Team Indus will compete. Multiple teams can win each Milestone Prize. Maybe it was related to the first succcessful free flight of NASA’s Morpheus lander or the launch of China’s Chang’e 3 lunar probe. For whatever reason, there seems to be a pre-Christmas rush on planetary press conferences and announcements. In the last six days, three separate projects have revealed details of their plans for robotic missions to the Moon and Mars. Last Thursday, Moon Express unveiled its MX-1 lunar-lander design in front of 10,000 people at the closing session of Autodesk University in Las Vegas. 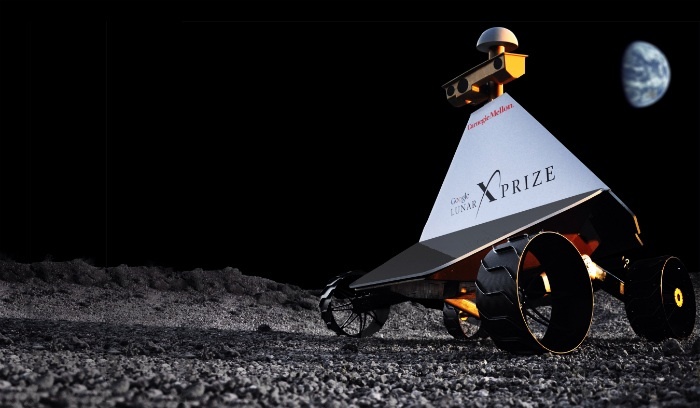 Two Google Lunar X-Prize teams are merging. Moon Express has announced an agreement with Huntsville-based Dynetics to acquire the Rocket City Space Pioneers team. The agreement allows Moon Express to leverage the work of RCSP and its partners: Dynetics, Teledyne Brown Engineering, Andrews Aerospace, Draper Laboratory, The University of Alabama in Huntsville, Von Braun Center for Science & Innovation, Pratt & Whitney Rocketdyne, Moog, Huntsville Center for Technology, and Analytical Mechanics Associates. The agreement also allows for the transition of RCSP team leader Tim Pickens to the role of chief propulsion engineer for Moon Express. Pickens was the lead propulsion designer for Burt Rutan’s SpaceShipOne, which won the $10 million Ansari X-Prize in 2004. Both Moon Express and RCSP/Dynetics were selected for NASA lunar data-purchase contracts in the fall of 2010. The contracts are potentially worth up to $10 million each. Moon Express was also selected by NASA for a Innovative Lunar Demonstration Data contract, worth up to $10 million, in 2010. 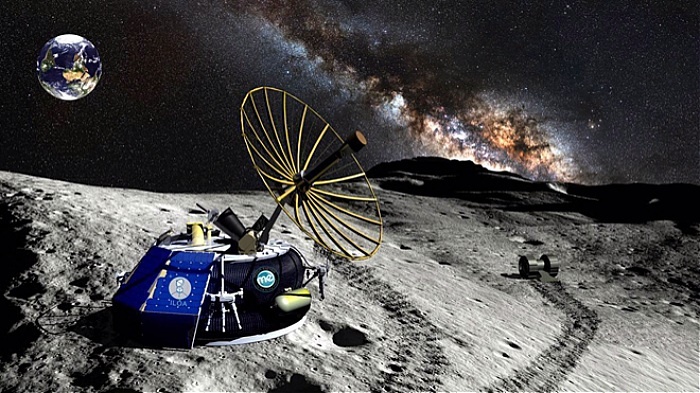 The ILDD program pays companies for access and insight into commercial lunar plans. Moon Express, based at the NASA Ames Research Park in Silicon Valley, is considered one of the leading contenders to win the $30-million Google Lunar X-Prize. Forbes magazine called Moon Express one of the 15 “Names You Need to Know” in 2011. Leadership is relative, however. None of the Lunar X-Prize teams have been burning up the track and skeptics are beginning to doubt that the Google Lunar X-Prize will be won before the prize money expires. So, this merger must be viewed as a positive sign. Perhaps, with their greater resources, the combined team will start to get some traction. The X-Prize Foundation put together this video showing some of the hardware development and testing being conducted by the registered teams. 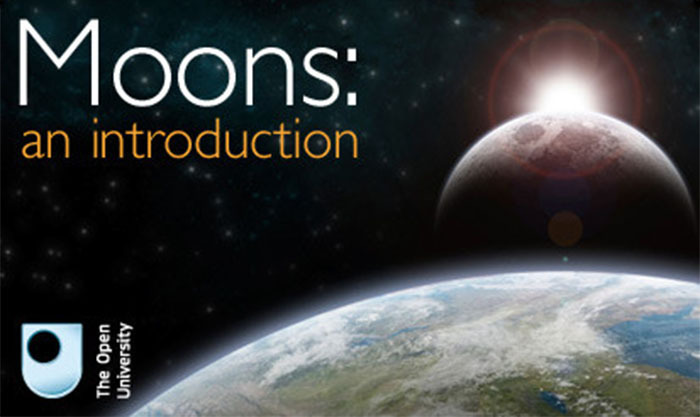 The Open University has created an online course covering the solar system’s most important satellites. Course materials include videos on Earth’s Moon as well as Europa, Phobos, Deimos, and Titan, an interactive quiz book, and a multi-touch textbook on moon rocks. All available free on iTunes. Citizen scientists who are interested in the Moon can find a wide range of activities. Whatever your level of ability, resources, and interest, there is a citizen-science activity you can participate in. Robert Staehle of JPL gave a presentation on Interplanetary CubeSats at NASA’s Institute of Advanced Concepts On March 28. The interplanetary CubeSat idea is rapidly catching on, as demonstrated by the Interplanetary CubeSat Workshop scheduled to take place at MIT on May 29-30 with NASA Chief Technologist Mason Peck as keynote speaker. Planetary missions may soon be within reach of citizen scientists. Just getting a CubeSat into Earth orbit remains a problem, though. NASA’s Nano-Satellite Launch Challenge prize may help. A number of companies are already working on innovative solutions to the problem, including Premiere Space Systems (Nanolaunch) and XCOR Aerospace. The Moon Mappers citizen-science project, which has been in beta test since January, is now live. MoonMappers challenges citizens to pit their mapping skills against computer algorithms by identifying craters in Lunar Reconnaissance Orbiter images. The results will be used to train the computers to make better decisions, improving the crater-matching algorithms. The MoonKAM project, administered by Sally Ride Science, allows middle-school students to photograph the Moon using digital cameras aboard NASA’s Gravity Recovery and Interior Laboratory (GRAIL) lunar orbiters. Each of the two GRAIL probes, dubbed Ebb and Flow, carries four MoonKAM cameras. Three cameras with wide-angle lenses look forward, backward, and down. One camera with a telephoto lens looks down. The MoonKAM project, which began March 12, allows fifth-to-eighth-grade students to select target areas and request MoonKAM images of those areas using a web browser interface. Details on the MoonKAM project are available here. Interested schools can register here. You are currently browsing the archives for the Lunar Science category.